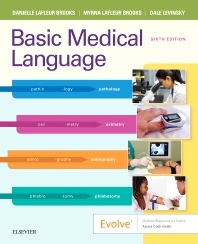 The perfect text for a shorter medical terminology course, Basic Medical Language, 6th Edition provides the foundation you need to confidently communicate with other members of your health care team. This basic medical vocabulary text focuses on building word skills by explaining a carefully selected group of suffixes, prefixes, and combining forms to provide the basis for recognizing and defining hundreds of medical terms. Clear, illustrated lessons present terms by body system, introducing word parts and providing review exercises that ask you to define terms or combine word parts to create terms. The new edition of this text also reinforces what you’ve learned with case studies, images, exercises and carefully crafted Evolve resources. Over 200 flash cards packaged free with the text make it easier for you to memorize terms. Electronic health record mockups provide exposure to the electronic health records that you will encounter in practice. Systemic presentation of medical terms helps you learn and recognize new words as you encounter them by combining parts. Case studies serve as review sections and provide additional opportunities for you to apply what you have learned. Engaging integrated exercises, including matching, building, and reading medical terms in context. Consistent organization and pacing of lessons ensures steady acquisition of terminology. Objectives integrated with headings clarify how the content is presented within lessons and show you how objectives relate to content.